Senators at the first Associated Students Senate meeting of winter quarter swore in two first year on-campus senators with a vote of 11-5-5, despite claims of illegitimacy and AS Legal Code violations. First years Batsheva Labowe-Stoll, a pre-political science major, and Reilly Hobson, a pre-economics major, were sworn in at 7:24 PM on Wed., Jan. 6. 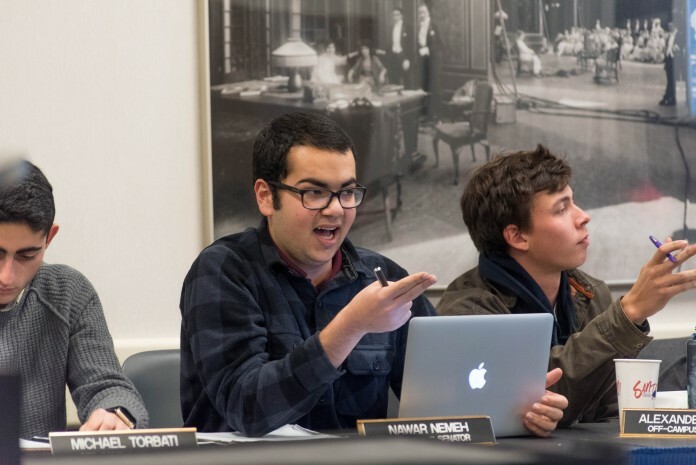 The search for new on-campus senators began toward the end of spring quarter, as the 66th Senate failed to appoint two elected on-campus senators. A search committee appointed second years Elizabeth Brock, an undeclared major, and Mercedes Rodriguez, a black studies and pre-political science double major. Following Brock’s resignation at the beginning of the summer, and the resignation of second year art history major Lacy Wright on Oct. 14, there have been two vacancies on Senate. The committee began work in Nov. 2015, advertising to all the residence halls. Seventeen students applied, with ten being cut via paper applications, and five more following the interviews. Some senators said that they saw no fault with the process of the search committee. But according to second year history of public policy major Nawar Nemeh, who served on the search committee, the committee violated AS Legal Code, which stipulates that the positions must be filled within five weeks of the vacancies. Additionally, the committee did not complete conflict of interest forms, which are required of every committee in AS. These forms specify the relationship between candidates and the selection committee, defining conflict of interest as personal financial gain of members of the committee and their associates, or of AS with the interests of on-campus organizations. No minutes were taken at the series of meetings, which Nemeh claims is illegal, although it is not specified in Legal Code. In an interview with The Bottom Line, Nemeh stated that at the Dec. 3 meeting of the search committee to review the seven candidates remaining after the paper cuts, all members of the committee excepting the vice chair listed one candidate as the bottom choice. College of Letters and Science Senator and third year history of public policy major Stevan Abdalmalik, who did not serve on the committee, was the first to bring up the issues at the meeting, at one point raising his voice. He claimed that Hashemian broke neutrality by voting, and alleged bias in the chair and vice chair knowing the names of all applicants prior to voting, while other voting members did not. He also took issue with Hashemian’s behavior at the Jan. 6 Senate meeting. Nemeh says that the chair of the committee only votes in the case of a tiebreaker, but that the chair, First Senator Pro-Tempore and third year political science major Louis Mariano, voted. Hashemian, who served as an ex-officio member with speaking and recommendation privileges but no voting privileges, also voted and unfairly influenced the decision, Nemeh alleges. Mariano stated at the Senate meeting that votes were tallied with and without Hashemian’s vote, and the decision was clear. Nemeh claims to have drafted a letter regarding his concerns with the process, but as of press time, this has not been made available to the public or to certain senators. Rodriguez, who served on the committee, stated at the meeting that she was not made aware of this letter and that if Nemeh had issues, he should have brought it up during the process. Regardless, Hobson and Labowe-Stoll, the first freshmen senators since former senators Benjamin Shin and Nikki Calderon were appointed in 2012, will sit at the Senate table. All kidding aside, if senators are using their influence to put friends in positions of power, I am deeply concerned. Aside from the corruption, who the hell should trust a freshman to be a senator. When I was a freshman, I still had so much to learn about the ins and outs of this school. I do not feel justly represented by young and inexperienced individuals who assumed power based on the votes from friends and a party that in general is doing it all because they think it will look nice on their résumé.